Description - Incline mats are a great tool to teach basic rolls, walkovers, and hand springs and can be used as tumbling aids, crash pads, or landing mats. Easy to clean and maintain, these mats are constructed of cross-link polyethylene foam encased in an 18oz. vinyl casing, providing you with a soft yet durable tumbling mat. Our gymnastic wedge mats are very convenient and can be easily moved and storage. Size – 14" incline mats are 24" wide x 33" long, 15" incline mats are 29" wide by 59" long, and 16" incline mats are 36" wide x 72" long and are 36" long x 18" high when folded. Thickness – Available in 14", 15", and 16" heights. 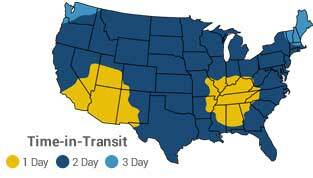 Weight – 14" mats weigh 13 Lbs, 15" mats weigh 27 Lbs, and 16" mats weigh 43 Lbs. Recommended Uses – Incline mats are the perfect tools for teaching hand springs, walkovers, basic rolls, as crash pads, tumbling aids, landing mats, in gymnastic studios, in home gyms and any where a portable incline mat is desired. Incline mats are very easy to clean. Unlike many other cheap incline mats available, our mats are constructed of durable 18 oz vinyl fabric. This means that no liquids can penetrate the surface of the mat and that the folding mat will be extremely resistant to punctures and tears. If the foam incline mats do get something spilled on them or appear dirty, all that is needed to clean them is to do a quick wipe of the tumbling mat with a damp cloth and your gym mat will look like new. Each mat features 4 handles. Great tool for hand springs, walk overs, and tumbling. Waterproof and easy to clean and maintain. The only size mat in our Incline Mats that folds is our 16" thick mat. 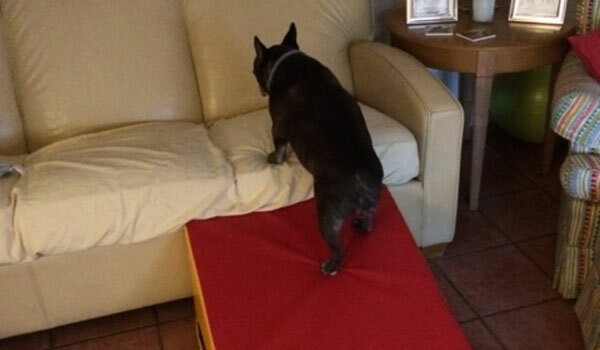 Here is a picture of our French bulldog Charlie using the wedge mat to climb up to “his” sofa. Since Charlie is 10 going on 11, he is incapable of jumping up to his perch. Jumping down is worse for his back as I can attest to from a resulting vet bill. We have a 10 year old French Bulldog - who hasn't missed a meal by the way - who was having difficulties getting up and down from the sofa. Most dog ramps, sold as such, were too narrow or too steep, while the Rubbber Flooring wedge turned out to be just right. She uses it in both directions which minimizes the stress on her back from jumping down. I highly recommend the wedge for this purpose. We are happy with the incline mat. the service the employees provided for us was outstanding. we had obstacles obtaining this mat, but the employees went above and beyond helping us make this happen. wonderful company.